Take a look at the hottest action figures of the 1980s and you’ll have a short list with G.I. Joe, Transformers, Masters of the Universe, Star Wars, Thundercats, Teenage Mutant Ninja Turtles, and Super Powers at the top. A considerable difference between these franchises is virtually all of them but one has in some fashion come back into style since. 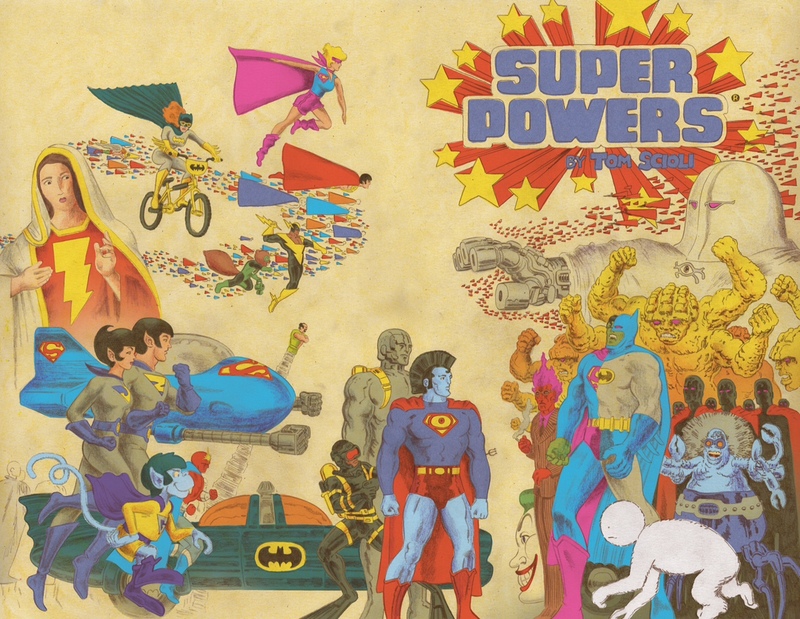 The Super Powers line from Kenner was a series of DC Comics characters based in part on the Super Friends cartoon animated by Hanna-Barbera, which ran in reruns for two years before the line resurrected it, that when manipulated in some manner would perform an action (hence its title “Super Powers”). The line persists somewhat today as there was a merchandising juggernaut behind the toys in things such as stationary, apparel, and domestics to name a few that you can still find made around the world in recent history and the DC Universe Classics toyline has often had paid homage to Super Powers, so far as to even produce some of the characters developed specifically for the line. However, DC Universe Classics only scratched the surface of Super Powers. The Mego Corporation for some time had produced toys for DC Comics (and various other companies like Marvel and Star Trek) and, while varied, it would eventually run its course. The success of Mattel’s Masters of the Universe toyline prompted DC’s interest to return to this market. 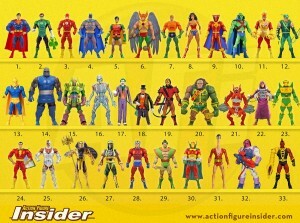 Eventually, Kenner was awarded the license to produce action figures and related toys based on DC’s properties because of its success with its Star Wars line and the concept to give the figures “super powers,” a rather remarkable feat sure to set it apart from virtually all other toys available at the time. 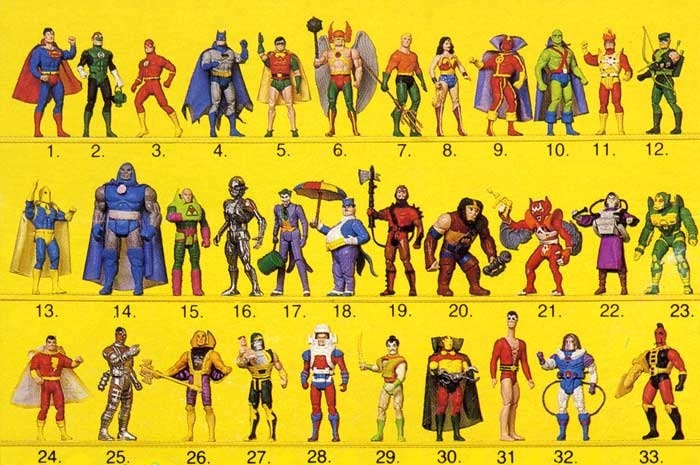 In its initial pitch to DC Comics, Kenner envisioned separate lines for each major character at the publisher. There would be a Superman line which featured the hero’s Supermobile and a vehicle for Supergirl called the Supercoupe, a Batman line with Batcave playset and his various assortment of vehicles, a Teen Titans line with a Titans Tower playset and figures for the assortment, and even a Lois Lane line which was in some fashion almost an adventurer series set in the vein of Mattel’s Barbie franchise (with another similar line that would have included various female DC characters like Supergirl and Wonder Woman). 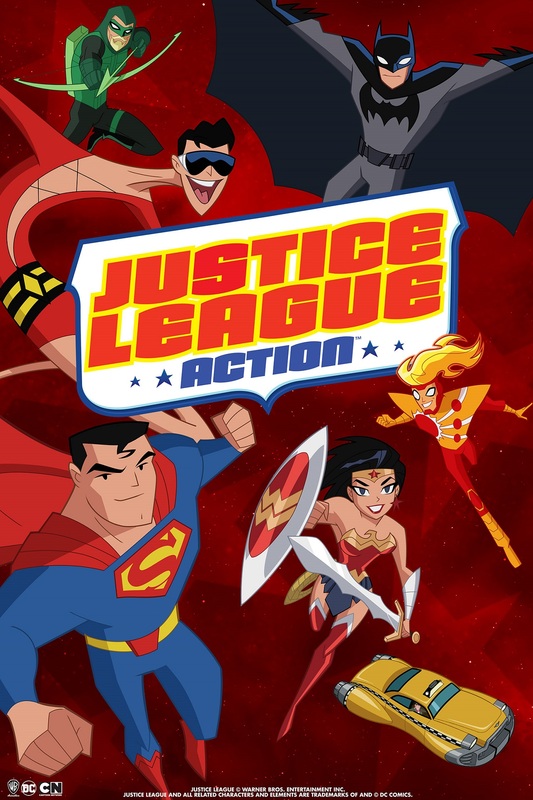 The concept would be pared down to focus on the Justice League of America, which was strong in the minds of young children due to the Super Friends television series which ran off-and-on since 1973 before ending in the United States in 1982 and airing popularly as reruns. Though, one line in Super Jrs would go on to be its own series geared towards young children which featured DC characters as adolescents. In the Super Friends, heroes Superman, Batman, Robin, Wonder Woman, and Aquaman were the various series stars (where the Flash, Green Lantern, and Hawkman were infrequent guest stars) which led to their inclusion in the first wave. The initial release included four villains, generally Superman and Batman’s most recognizable opponents Lex Luthor, Brainiac, Joker, and Penguin. Luthor and Brainiac were redesigned in the comics by George Pérez and Ed Hannigan, respectively, for the Super Powers line where Brainiac appeared as a robotic skeleton and Luthor in a suit of green and purple armor (Brainiac’s Skull Ship and Luthor’s armor becoming iconic representations of the characters that persist today). The initial release also included the Batmobile, Supermobile, and Luthor’s Lex-Soar 7 vehicles and a Hall of Justice playset (the headquarters for the Super Friends later adapted in the comics for the Justice League). 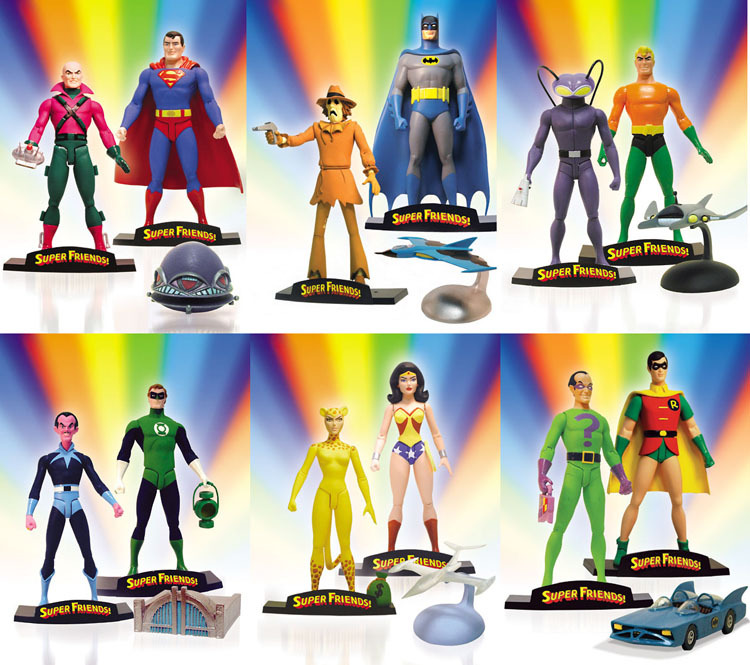 The line was a hit and is regarded today as one of the most collectible series of toys in the history of the American action figure market because of the elegant appearance of the figures (generally based on the DC Comics style guides featuring the legendary art of José Luis García-López beautifully rendered for the toys) and the unique feature of performing “super powers” without external buttons and switches (which generally entered the market after Super Powers’ demise). The series would last two more waves before popularity waned and ended. 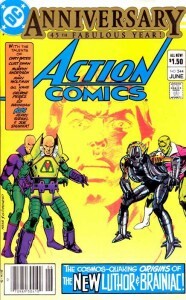 Before its end, Super Powers featured Jack Kirby’s characters and work (the creator helping design new appearances for his characters and vehicles for the line), developed what is today a much sought after action figure in Cyborg (paying royalties to George Pérez’ design of the character, which was rare for comics at the time), produced original characters Cyclotron and Golden Pharaoh, and rendered a Super Friends original in Samurai in plastic. The Super Powers line proved to be remarkably influential on the action figure market. Comic book competitor Marvel Comics was sure to develop a line of less sophisticated action figures with Mattel in the Secret Wars line (which was accompanied in the comics by a major crossover event of the same name, where DC produced three mini-series based on their line featuring the works of legendary creators Jack Kirby and Carmine Infantino). 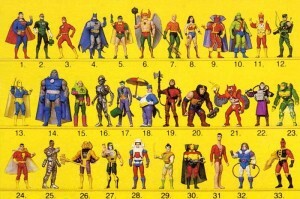 The Super Powers action figures themselves would be imitated (even outright cloned using their molds) for years through lines such as Toy Biz’ DC Super Heroes and Kenner’s Robin Hood, Shadow, and Swamp Thing respective series (Kenner’s Snare Arm Swamp Thing viewed by collectors as an unofficial Super Powers action figure). 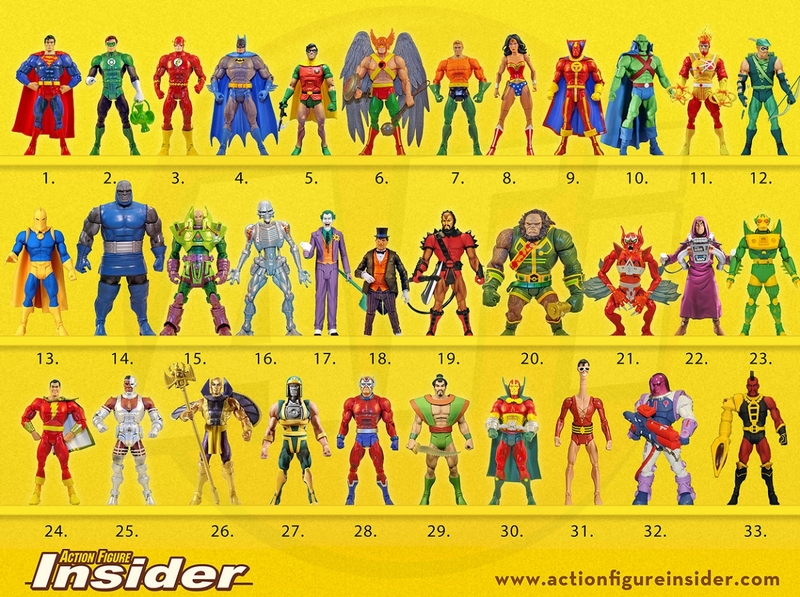 Mentioned previously, the line was a great inspiration for designers at Four Horsemen Studios who, under contract to Mattel, have fashioned several figures of the DC Universe Classics line on the Super Powers toys, oft times as variants (an upcoming Penguin figure is being remodeled to pay homage to his Super Powers counterpart). So, it’s an understatement to say there’s still a healthy market for the series. There has been a movement in recent years in the toy industry to reshape concepts that came before or outright honor a sense of nostalgia to collectors. Hasbro, who acquired Kenner, has paid homage to the original Star Wars line with their Vintage Collection series. Hasbro would also recently produce a Secret Wars toyline paying homage to the comic series and the earlier toyline for its 25th anniversary. 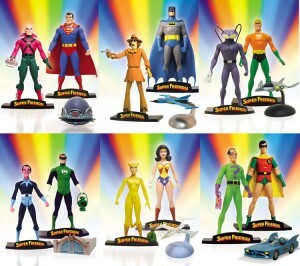 DC Direct in recent years has produced a Super Friends toyline and the Retro-Action line is in the vein of the earlier Mego figures. Secret Wars and Super Friends both operated by releasing figures in two packs. What could be done with Super Powers is re-releasing the figures with each wave broken into two sets where the first wave could be in two sets of six figures, wave two the same (including the Clark Kent mail-away), and the third wave in sets of five (unless you wanted to be clever and add a Green Lantern repainted as Riddler in a nod to the Argentinean Super Amigos and a Snare Arm Swamp Thing). 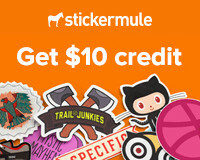 To give fans a real hoot, you could toss in tchotchke like mini-comics, posters, or even some of the stuff you would mail in for like a Superman cape or mini-CD of the Darkseid Saga. Should this prove successful, you could even move into the proposed, unreleased waves four, five, and six. With known prototypes for El Dorado, Man-Bat, Quadrex, Shockwave, Silicon, and Rocketman, you’re already roughly halfway prepared for a fourth wave. Make up some playsets and vehicles as well (the chief complaint for something the DC Universe Classics line lacks), deliver those proposed Tower of Darkness playsets and All-Terrain Trapper vehicles which are known to exist and are much sought after by collectors for their extreme rarity. You can even go another step if success continues and adapt some more of García-López’ style guide art from the time into toys: imagine a set with the Phantom Zone prisoners (Zod, Faora, and Kru-El drawn by García-López in the guide, but you could include Jax-Ur, Quex-Ul, and Va-Kox time period appropriate for the set) or the Teen Titans with Nightwing, Wonder Girl, Starfire, Jericho, Changeling, and Raven. Another treat that would drive collectors wild would be reproductions of the Brazilian Estrela Plastic Man, Shazam, and Cyborg mini-comics.